When I heard about this I took a glance at my calendar to make sure I hadn't slept through March and it wasn't April Fools' Day. It isn't, so I think it's for real. 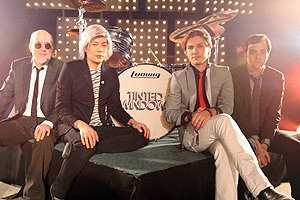 Apparently, two Chicago music veterans - James Iha of the Smashing Pumpkins and Bun E. Carlos of Cheap Trick - have joined forces with Fountains of Wayne bassist Adam Schlesinger and Taylor Hanson, the middle Hanson brother, to form a "supergroup" called Tinted Windows. According to the band's site, they already have an album in the can for release on April 21 and will play at SXSW on March 20. If you're wondering what this unlikely concoction of musicians might sound like, the band's press release mentions "fusing the sounds of power-pop, rock and New Wave of the late 70's and early 80's...with the more modern rock and pop sounds of their own groups. 'We talked about everything from from The Buzzcocks to The Knack,' says Iha. 'And, of course, Cheap Trick.'" Doesn't sound so bad, actually.